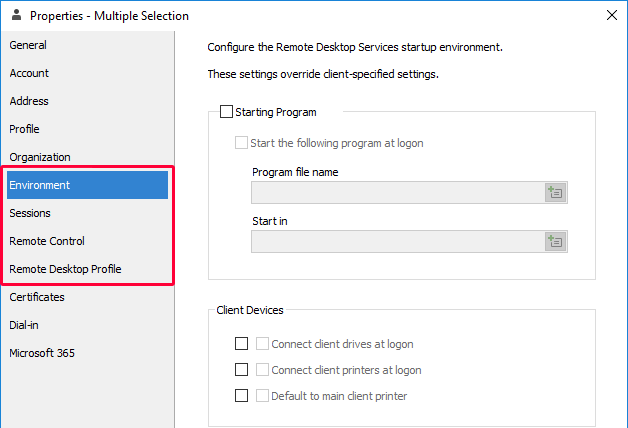 In this tutorial, you will learn how to configure Remote Desktop Services settings for multiple users in one operation and how to use value references like %username% and %department% to apply different settings to different users. 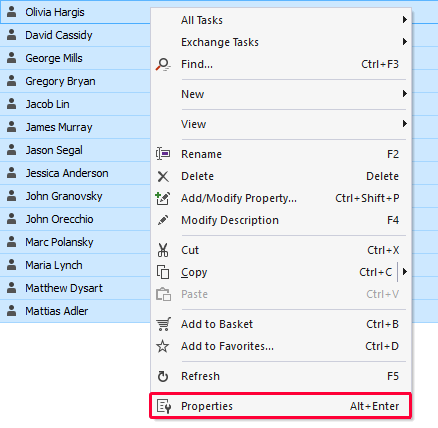 Select the user accounts whose settings you want to change, right-click the selection and click Properties in the context menu. If the user accounts you want to configure are spread across different Organizational Units or domains, you can add them to the Basket first. To add an object to the Basket, right-click it and select Add to Basket in the context menu. Environment - settings for the Remote Desktop Services startup environment. Sessions - timeout and reconnection settings for Remote Desktop Services. Remote Control - remote control settings for Remote Desktop Services sessions. 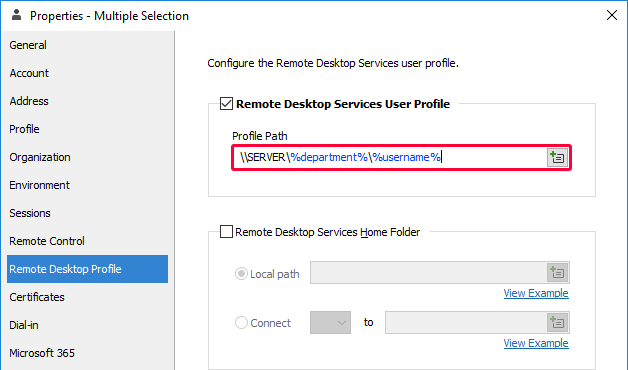 Remote Desktop Profile - user profile settings for Remote Desktop Services. To modify a setting, check the checkbox next to it. To set different settings for different users, you need to use value references like %username%. Before the changes are applied, value references are replaced with corresponding property values of each selected user. For example, if you enter the following template for the profile path: \\SERVER\%department%\%username%, the value references contained in the template will be replaced with the values of the Department and User Logon Name properties of the user accounts, and the generated path will look like \\SERVER\Sales\johndoe. You can configure Adaxes to automatically apply specific Remote Desktop Services settings to newly created user accounts. For details, see Automatically Set Profile Path for Remote Desktop Services.